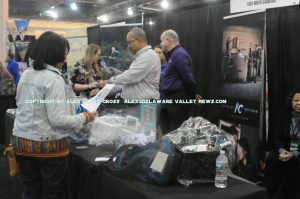 Alex Lloyd Gross Photo- Delaware valley News.com People get information on trips at the show. The Travel and Adventure show was held this past weekend, March 110 and 11 2018 at the Pennsylvania Convention Center. Just in time for spring. Most people plan their vacations in the early spring. The weather is just turning warmer and transportation is a bit less likely to be grounded due to bad weather. Inside the show, people were able to go to any one of a number of booths to get information on specific travel. From New Jersey to Ireland. It was all there. There was even a cruise line that caters to adults. The last thing people want on a cruise is to be with a wrong age group. If you are 27 and the median age on the ship is 62, that might be a problem. The last thing you want is to go on a cruise to meet someone and find out it’s a gay themed cruise. Going with a travel agent is your best bet. They can make sure everything is what you want. There were some speakers and seminars during this event. It comes back every year. If you are looking for ideas on where to go for your next trip, this is the place to get them.